Gurmit's one of kind precious Squeezemoi ring in 18k white gold, amethyst and diamond inspired by the turbands of her heritage from the regent of Punjab. Prince Albert of Monaco's fund raising for his foundation . May 2017. Prince Albert of Monaco's fund raising for his foundation . May 2017 in Monaco at the Prince Albert II of Monaco's Foundation fund raising event for Monaco-based charity which donates millions in various environmental projects. Rothschild2 ring in 18 k rose gold , pink sapphire , ruby , diamond and south sea pearl. Gurmit's Orientalistic necklace in 18k yellow gold , mother-of-pearl and diamond. NOT TO BE MISSED!! Gurmit’s is exhibiting her creations of fine jewellery at the Goldsmith Fair 2016. Gurmit’s is exhibiting her creations of fine jewellery at stand 75 from Tuesday 27th September till Sunday 2nd October 2016 at the Goldsmith Fair 2016. The Goldsmiths’ Hall, Foster Lane, London, EC2V 6BN.+44 (0)20 7606 7010 ext 2045. Gurmit's is a story straight out of a Bollywood film. GURMIT KAUR CAMPBELL AN UNFETTERED SPIRIT. An Unfettered Spirit by Shanoo Bijlani for Adorn Magazine July 2016. With artist Olivier Strebelle http://www.olivierstrebelle.com/en/ in his home in Brussels designed by Andrea Jackman. The outstanding works of Philippe Wolfers were of great importance for the entire Art Nouveau jewelry. Inspired by the Symbolism Movement and its dream like themes, he used gold, precious stones and expensive materials, to create luxurious jewelry, with floral, animal and natural designs, sensual female forms, with fluid, sinuous symbolic ornaments. The work of Philippe Wolfers (1858-1929), a Belgian jeweller, sculptor and glassware designer. This Zen Garden ring reminds me of my time 30 years ago at Des Arts Et Metiers in Brussels where I trained as a goldsmith and inspired by the works of Philippe Wolfers (1858-1929), a Belgian jeweler, sculptor and glassware designer. Women's Jewellery Association AGTA Spectrum Award ceremony in New York. Receiving my award for "Betwix And Between" ring as the 1st place winner in the 2016 GemDiva division of the AGTA Spectrum Award 2016. Betwix And Between ring . 18K yellow gold , south sea pearl and diamond. Winner of 2016 GemDIVA, Spectrum Award. 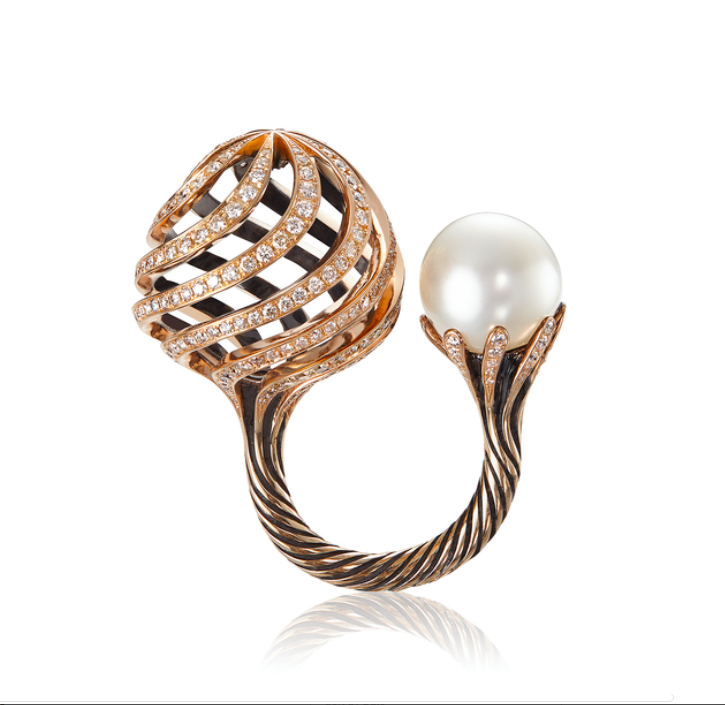 "Betwix And Between" ring in 18K yellow gold, South Sea pearl and diamonds sponsored by Noelle Griendl and Catherine Lippens. 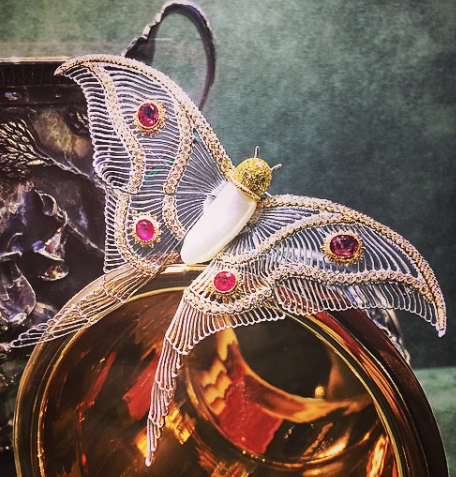 Buccellati exquisitely crafted Butterfly brooch.